Not So Run of the Mill: Sandra Stevens, seen here with her patient Janette Rodgers, has made national waves with her underwater spinal cord injury research at MTSU. The result of research often is shown in hard and fast metrics. For Janette Rodgers, the only metric she cares about is that her wheelchair, once her prison day in and day out, now sits empty 90 percent of the time—in large part because of the hours she spent in 270 gallons of water. After suffering a broken neck and spinal cord damage in a car accident in 2007, Rodgers, 53, was nearly taken off life support. Later, doctors told her she would never walk again. A year later, she was a participant in Dr. Sandra Stevens’s underwater treadmill study at MTSU, where she gradually managed to take a few steps with assistance. Today, Rodgers’s husband, Terry, watches as his wife walks 500 feet every day to the mailbox at their home in Rockvale, Tenn.
“She pretty much does all the housework now—dishes, laundry, cleaning floors—and she keeps up with the shopping a lot better. There’s a big improvement in her outlook,” says Terry Rodgers, as he glances over at his wife going through her underwater paces. “I used to do most of it, and I didn’t care for it,” he adds with a grin. “If you quit trying, you’ll quit improving,” Stevens yells over the whirring of the treadmill. Dr. Don Morgan, MTSU health and human performance professor, brought the treadmill to the University a few years ago. He describes the therapy as “relatively new technology.” Morgan and his graduate students, including Stevens, began their initial work with the treadmill using funding from the National Institutes of Health. Stevens graduated from MTSU in December of 2010 with a doctorate in human performance. She recently accepted a postdoctoral position at MTSU and is now testing participants for a new study of people with spinal cord injuries (SCI) who have no ability to move their legs whatsoever. 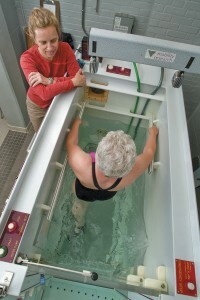 Throughout 2009, she worked with 12 people, including Rodgers, who had severe SCI, utilizing the underwater treadmill. She found that, as a group, they demonstrated a 57 percent increase in leg strength, 39 percent improvement in balance, 34 percent improvement in preferred walking speed, 61 percent improvement in rapid-walking speed, 82 percent improvement in a six-minute walking distance, and a 121 percent increase in the number of steps they took in their own environment. “Everybody had some measure of improvement,” Stevens says. Participants also demonstrated greater than typical cardiac responses to training. So the more training increased, the more muscles worked to increase blood flow to the heart and the more signals sent to the brain by nerves in the muscles triggered the appropriate cardiac response to exercise. Almost all participants reported improvement in mobility, greater independence, better general health, and improved mental well-being. Some said they could climb stairs without assistance, and others said they could reach over and pick up something off the floor, including themselves, if they fell. One participant who had leg braces said he stopped wearing them because he had built up so much muscle in his legs, the braces no longer fit. “Then he realized he didn’t need them,” Stevens says excitedly. That a researcher could show such excitement and compassion about a patient’s recovery perhaps in part derives from a horrific personal experience Stevens suffered while she was a Fulbright scholar in Africa in 1998. During that trip, a bus Stevens was on hit another bus head on, fell off a bridge, and plunged into a river below. Five passengers died. Stevens was pulled from the wreckage by a Guinness beer truck driver who had been following her bus. She lay on the riverbank for hours before she was airlifted to Geneva, Switzerland, for treatment. She wondered if her injured left arm would have to be amputated or if it might become diseased and cause her death. Stevens also lost part of her right hand in the accident. It is an experience she says helps her identify somewhat with the personal suffering her patients have experienced in the loss of the use of a limb. Stevens’ research has garnered significant interest from media outlets and occupational health professionals alike. MTSU’s resulting brand as a leader in underwater treadmill research has even attracted potential investors with designs on building an aquatic research facility at MTSU—one that would expand spinal cord therapy research but also potentially allow MTSU to become a leading research voice for the use of aquatic exercise to reduce the national cost of big-dollar diseases such as diabetes and obesity. As such, MTSU is poised not only to help those who need therapy but also to provide hard-and-fast metrics on other positive outcomes of aquatic therapy.